(Charlottesville, VA–October 31) Getting destroyed by tennis pros on court while competing for the US Open National Playoffs five years ago wasn’t enough for me. I wanted more, and yesterday I did something I should have done 40 years ago: I was a ball boy. I don’t want to sugarcoat it by calling myself a ball person, because I was a boy out there. I’ve been to the Charlottesville Challenger every year since 2012, and I guess I wanted to mix it up a little for my seventh installment of the tournament. I responded to a call on the Challenger’s Facebook page for ball people and noticed that they had very few volunteers during the school week. I signed up and watched a couple of YouTube videos about how to be the best ball boy ever. The only thing I remember from the videos was how to hold the towel on the edges so the players don’t have to touch your hands. It turns out that was wasted knowledge in a Challenger. I donned my red ball boy shirt and no sooner that I had, I ran into top seed Tennys Sandgren. After we greeted each other, he said, “So you’re chasing down balls all week?’ I told him it was, sadly, a half-day gig. Then I went down to the court and got a comprehensive crash course from Ball Person Coordinator Maureen O’Shea. The biggest two rules were: do nothing between a first and second serve and always keep looking at your fellow ball people and the player on your side. She explained that with so many college players in the ranks of the challengers, these guys were just happy you were retrieving their balls. And they could care less how you held a towel out to them. And as you may already know, the bulk of the “work” for a ball person occurs when the player on their side of the court is serving. Then you’re expected to do towel work and ball retrieving, which is more challenging than it sounds. I was served the Frederik Nielsen-Edward Corrie qualifying final. As a forty-eight year old, there was no way my knees were camping out in front of the net for a few hours, so I opted for the baseline. The first thing I noticed was when my player was returning serve. The balls are headed for your own private orbs at 120 miles per hour and the first several times a serve was headed my way, I flinched and moved, forgetting that the player in front of me was going to intercept at least 90% of those shots for an attempted return. I learned to dodge the balls that got through. During the second set, I decided to stop dodging the balls and try to catch them instead. Less bending over would be nice. That was a mistake. I caught a Nielsen first serve that had to be over 120 mph. I immediately felt a pain in my hand but tried to ignore it. I made sure to never try to catch another one. I’m sure many a 9-year-old could teach you like a pro at this, but it was a sensory overload for me. You’re handing the player the towel while balls are rolling at you from all directions as the player on your side of the net prepares to begin his service game. Nielsen was a big ball-checker. He wanted to examine all four balls before each serve and then he’d kick back one or more. The players will not make eye contact with you before tossing the unwanted ball back, so, once again, you’ve got to pay attention. And in a tournament like Charlottesville’s, it’s even more difficult because you have matches and practices going on all around you. I heard the crowd gasping during a long rally on the adjoining court and kept looking over before realizing that I would get beaned in the face if I didn’t pay attention to my own match. With my short-attention span, this was invariably the toughest part of the gig. Another difficulty I noticed as a tennis fan was controlling the urge to clap after a great shot. I had to stop myself a few times. No one was closer to the action with some of these great returns and I was happy I’d left my phone off court because I would not have been able to resist the urge to tweet during my on court duties. I love the front row and I’ve been in the photographers pit at other tournaments before, but this was a ridiculously good view. You’re making eye contact with the players every 30 seconds. You get a better view of the players than their opponents do. Another strange distraction was finding myself rooting for the players to finish the match. The Chair umpire sits all match. The linesmen get to sit down occasionally. The players get their Hollywood Producer folding chairs for changeovers. But no, the ball people have to stand all day. The breaks between sets never seemed so long in my life. I mean, it seemed like they could have run 100 commercials in between those sets, if that were actually a thing and fans were watching a challenger qualifying final on a major television network. Nielsen won the first set, 6-4 and went up a break in the second. I started thinking the end was near. Corrie was in a bad mood, and cursed at the people walking on the catwalk above his opponent as he prepared to serve. But then Nielsen blew a couple of match points and Corrie had squeaked through the second set tiebreak at 6. I remember feeling relieved when the chair announced, “final set”. Now Corrie had a swagger and Nielsen, who had been even-tempered throughout, started losing it. He talked to himself, yelled at no one, and when he gave up an early break in the third, he smashed a racket 3 feet away from me. This wasn’t a toss or a smack: he spiked it into the court with hundreds of pounds of thrust, as if to make sure it was dead and never coming back to life. After Corrie was issued an obscenity warning, Nielsen fired back, “I already thought he got one earlier!” The chair indicated that Corrie had only been “accosted” for the first one but that didn’t seem to be any solace for Nielsen. Nielsen himself dropped some F-bombs in the third, but quietly enough to only treat the ball people into the demons in his head. When it was over, Nielsen put the racket in the little trash can behind the umpire chair and strutted off as mad as hell. It must feel like such a waste to win two qualifying matches at an ATP Challenger, only to blow a lead in the final and walk away with nothing. As for the smashed racket, tournament organizers quickly removed it from the bin and took it away from plain sight, as if not to encourage such further behavior to those who would witness the mangled mess. I always love to hate on the players when I hear of ball person abuse at the majors. I could find no such mistreatment in my match. They were good to us, even during the low points of their endeavor. I didn’t get a chance to think about my hand again until after the match, but when I did, I found a big bruise on my thumb. From a tennis ball! Well, not just any tennis ball, but one served up by a Wimbledon Mixed Doubles champion. Wow, I’m so out of shape, I thought, I can even get injured doing ball boy work. It feels fine a day later but I felt it yesterday. No big whoop. Honored to serve. And it happened in the line of duty. The tonic my physician prescribed at the brewery down the road made it all better. All I know is this: ball kids, you’re awesome. You have to be laser-focused at all times on court or else you’ll get a dirty look from someone, or worse, you’ll get hit—hard. I will never look at you the same way again. You make it look easy. And like most things in life, it’s a hell of a lot harder than it looks. UPDATE: And oh, yeah, everything anyone ever does ends up on the internet now. Posted in: Aegon GB Pro Series, ATP Challenger, Glasgow, ITF, Niall Clarke, On Site. Tagged: 2015 ATP Challenger, 2015 Glasgow Challenger, 2015 Glasgow ITF, 2015 ITF, 2015 ITF women's, Aegon GB Pro Series, Aegon LTA, Aegon Pro Series, Alex Ward, Alexander Ward, Alice Matteucci, Andrea Arnaboldi, Andrej Martin, atp challenger, atp challenger tour, Brit LTA, British LTA, Daniel Smethurst, Ed Corrie, Edward Corrie, Ewan Moore, GB Pro Series, GB Tennis, Glasgow, Glasgow Challenger, Glasgow ITF, Glasgow Tennis, Isabelle Wallace, itf, ITF Women's, Josef Kovalik, Louk Sourensen, LTA, LTA Tennis, Marcus Willis, Matteo Viola, Maxime Authom, Nils Langer, Pedja Krstin, Pirmin Haenle, Roberto Mancora, Scotland, Scotland Tennis, Scottish Tennis, Scottish Tennis Championships, Tennis Scotland, Tristan Lamasine. Due to travel I missed the first day of the Glasgow event, on the Aegon GB Pro Series but I am here for days two, three and four. The first match on the main court was a women’s singles qualifying match between Alice Matteucci [ITA] and Isabelle Wallace [GBR]. The 17 year old Brit is ranked 683 in the world, over 200 places behind her 18 year old opponent. However it was Wallace that came out firing as she held to 15 and broke her opponent the next game. Matteucci seemed to be struggling with serve, hitting 3 double faults on her way to being broken. The Italian called a medical time out at the end of the game and unfortunately retired 2 points later. A rather disappointing way to start the tennis day. After getting a brief look at some of the womens talent on display, it was time for the first mens singles match of the day. The number 4 seed Andrej Martin faced Germany’s Nils Langer. Both players struggled on serve in the first set, serving below 50% and hitting a combined 8 double faults. Martin missed his opportunity to serve at the first set a 5-4, but it didn’t matter in the end as he the Slovak dominated the tiebreak to take the first set 7-6. There were some absorbing rallies, and good all court play from both players but ultimately the world number 185 was too strong. Martin breaks Langer to take the match in straight sets. My attention soon turned to court 8 as the match between eighth seed Matteo Viola, and British qualifier Marcus Willis was about to begin. Willis has defeated Daniel Evans to qualify for the event, so he was coming into the match in good form; and he soon showed it. Using his big serve and variety, the Brit took apart his Italian opponent in less than an hour. 6-2,6-2 was the final result, resulting in a rather tame exit for the number eight seed. As for Willis, watching this match made me wonder why Willis is ranked 357 in the world. He has certainly showed that he has the talent to be ranked a lot higher. His use of the slice, drop shot and serve were particularly impressive today. Whilst Willis was busy defeating Viola, another Brit took to the court on number six. Roughly 100 places separate Daniel Smethurst and Andrea Arnaboldi in the rankings, but that didn’t matter to the British wildcard. The match was as tight as you can get, but Smethurst managed to squeak the lead, 7-5. The Brit’s ability to come to the net effectively was causing the fifth seed problems, but Arnaboldi seemingly found a way to counter it. The Italian broke to serve for the set, but the Smethurst remained headstrong and broke back to make it 5-4. The set seemed destined for a tiebreaker at this point, and that’s what we got. Smethurst got the early mini-break and raced ahead to a 6-1 lead. Arnaboldi was game enough to save three match points, but at 6-4, Smethurst delivered an un-returnable serve to seal the match. The good fortune of the British players continued. There was a guarantee that another British player would advance to the second round as an all British clash was next on court 6. Edward Corrie faced Alexander Ward in what turned out to be on of the more one sided matches of the afternoon. Ward came out of the blocks firing serves like Ivo Karlovic, but it wasn’t too long before Corrie took control of the match. 100 places separated them in the rankings, and it certainly showed as Corrie tightened his grip on the match with his more aggressive play. The world 243 broke to win the first set, and early in the 2nd set on his way to sealing a comfortable 6-3,6-3 victory. The last British hopeful was a local player named Ewan Moore. He faced Italian Roberto Mancora, who is ranked 233 in the world. It was all too easy for Mancora as he raced to a straight sets win in under an hour. In other results, Maxime Authom straight setted Ireland’s Louk Sorensen for the loss of two games. Tristan Lamasine dispatched his qualifier opponent, Pirmin Haenle in straight sets 6-2,7-6. Finally in the only three setter of the day, Pedja Krstin came from a set down to beat higher ranked opponent Jozef Kovalik 3-6,6-3,6-3. The action will continue tomorrow with the rest of the ATP challenger first round matches, and the start of the ITF women’s singles main draw featuring Tennis Atlantic’s own, Conny Perrin. Posted in: ATP, Charlottesville. 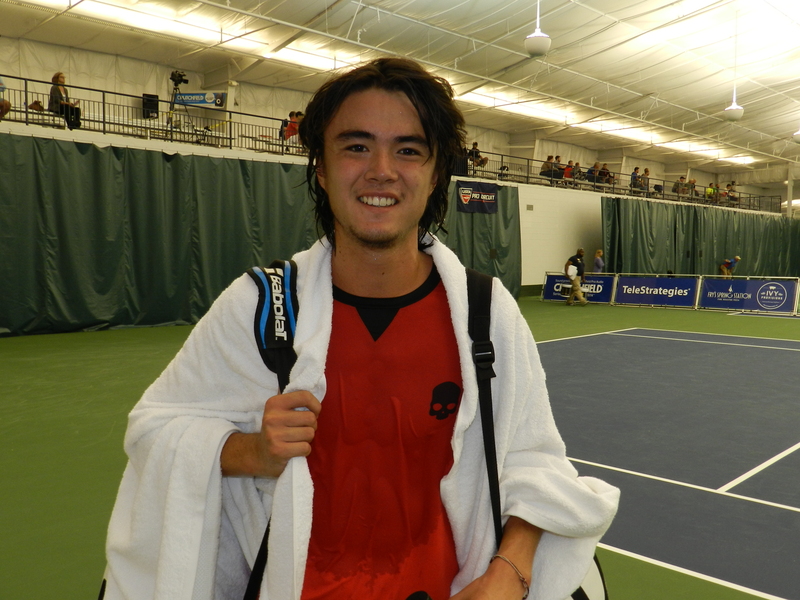 Tagged: 2014, alex kuznetsov, atp, challenger, charlottesville, darian king, Edward Corrie, Main Draw, mens, monday, order of play, results, taro daniel, tennis, Tuesday, usta pro circuit, Virginia. Posted in: AEGON International, ATP, ATP Challenger, Charlottesville, Steve Fogleman, USTA. 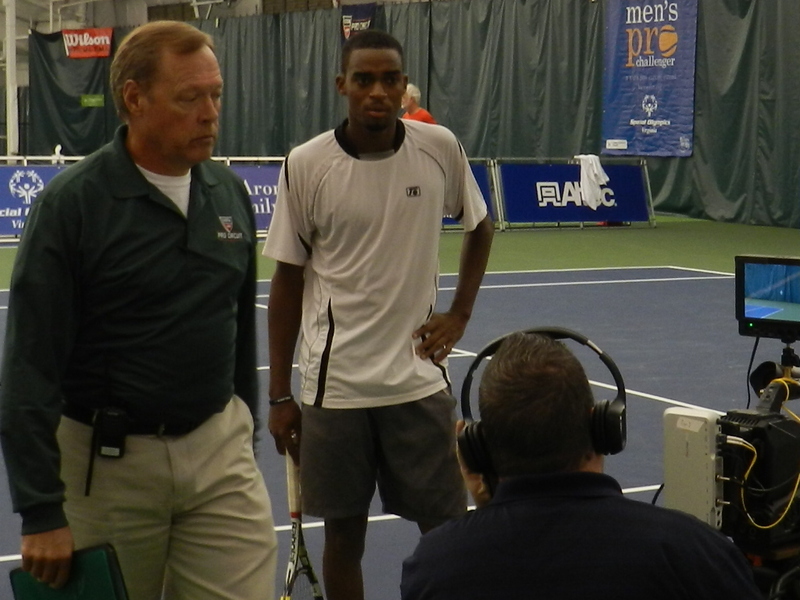 Tagged: 2014, atp, barbados, challenger, charlottesville, darian king, Default, Edward Corrie, england, Keith Crossland, mens, Steve Fogleman, tennis, usta pro circuit, Virginia. 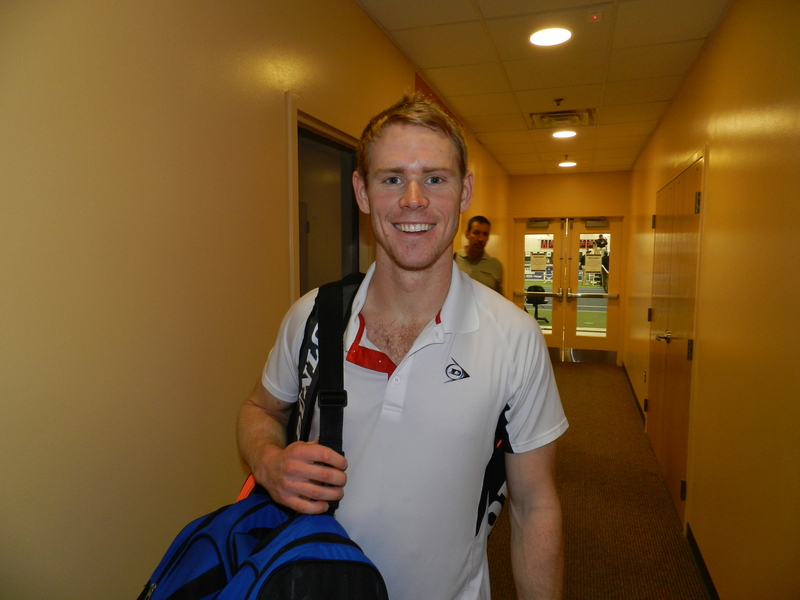 Edward Corrie won a first-round match today at the Charlottesville Men’s Pro Tennis Challenger at the Boar’s Head Resort, but in most peculiar fashion. After taking the first set, 6-3, from Darian King of Barbados, Corrie shook off a break and took King to a second set tiebreak. 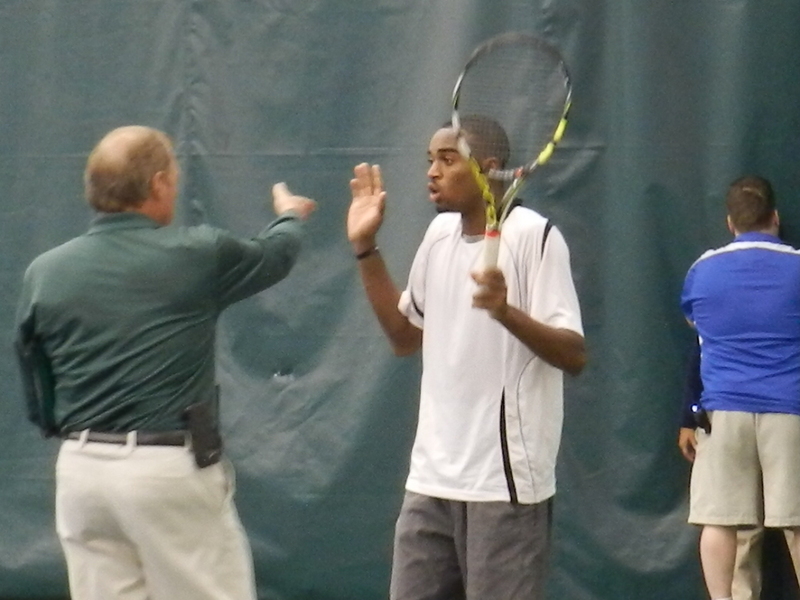 King, who had been animated and argumentative throughout, lost a point at 2-5 in the breaker. Disgusted, he very aggressively tossed his racket behind him toward the curtain. What happened next is a bit of a mystery. It needn’t have been, but it was. The sound caused by the racket hitting the curtain was very loud and echoed throughout the cavernous indoor facility. As all eyes turned to the sight of the boom, the linesman behind King fell over and let out a cry. 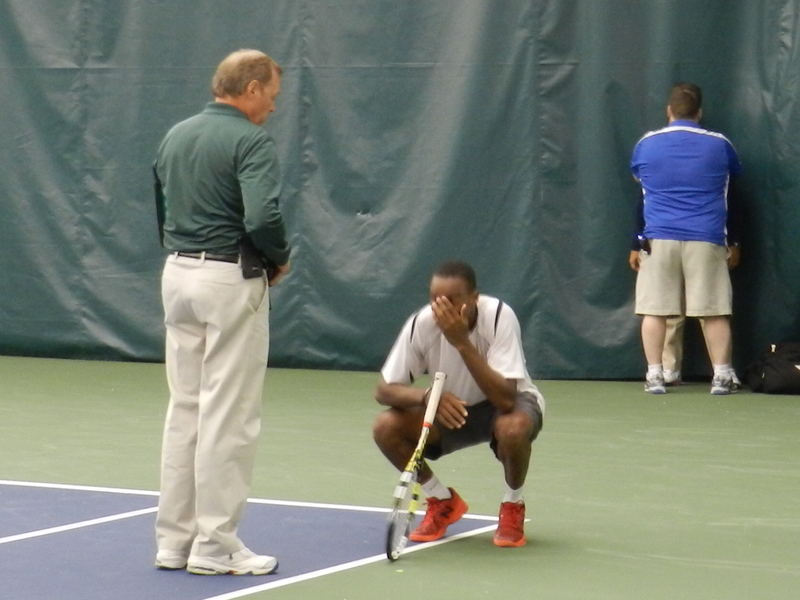 I raced over to Court 7, where King grabbed his racket and quickly left the scene of the accident. He went to the net and told a curious Corrie, “She’s fine”. He stayed at the net for several minutes, apparently ready to keep playing. The linesman remained down for at least five minutes. The longer she remained on the ground, King told anyone who would listen that “I didn’t hit her”. Finally, Challenger Supervisor Keith Crossland came over and told King that he would likely be defaulted for his negligence. King appealed and asked to go to the match video. Crossland initially allowed this request, and I thought for a minute that he might go “under the hood” like an NFL referee. 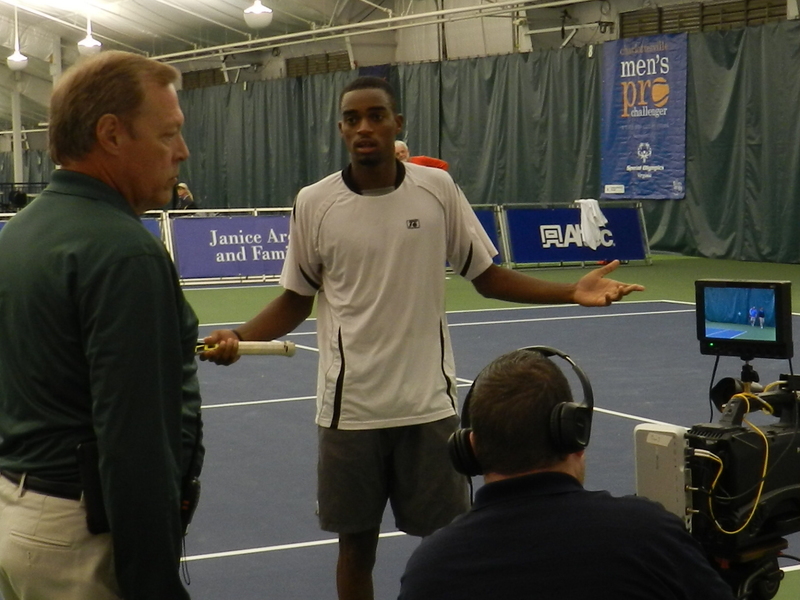 King was upset that the camera operator could not pull up a replay, and Crossland said, “Maybe we’ll watch it later”. As King stormed off to the locker room, he continued his Not Guilty plea. “I did not hit her!”, he proclaimed, as he disappeared into the toilet-and-shower sanctuary. One twitter user who was watching the feed said that King’s racket hit her in the neck. After speaking with several onlookers, the consensus was that the racket hit the linesman on the ricochet off of the curtain. Tournament officials indicated that they believed the linesman would be alright. Still, what a loveless job. I mentioned that it needn’t have been a mystery. Last year, I was aggressively forbidden to shoot a point at this same Challenger by Keith Crossland, due to “video rights”. Yeah, right. Like anyone watches this stuff except us tennis junkies. So I comply. I can’t find a link anywhere online to show you what happened. If I had been allowed to shoot video, you know I would have had it on youtube within the hour. And the mystery would’ve been solved before dinner. Way to go, Crossland! UPDATE: Our own Chris De Waard just sent me a youtube link from someone who stole the feed. Maybe Crossland should go after him for being such a terrible scofflaw. 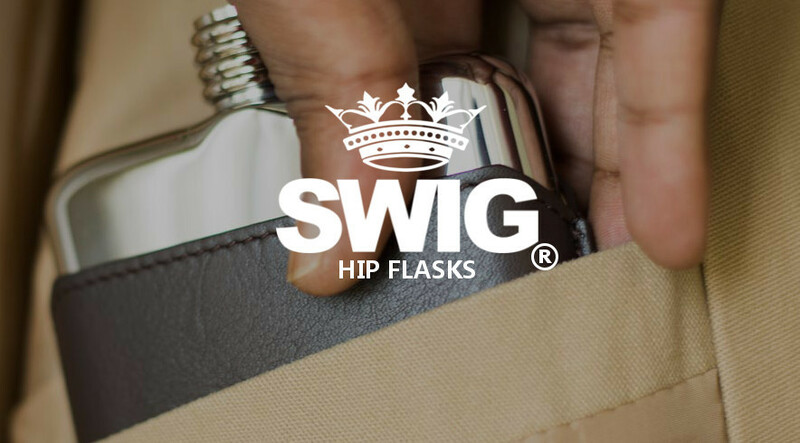 Thanks to that scofflaw, you can now judge for yourself.